Day 38 - Macon to W. Quincy, MO? THE ARMY A-WHEEL. – STORY OF THE TWENTY-FIFTH U.S. INFANTRY BICYCLE CORPS’ JOURNEY. – From Fort Missoula, Montana, to St. Louis – Through the Fertile Valleys and Across the Beautiful Rivers of Picturesque Montana, and Over the God-forsaken Sand-hills of Nebraska to the Big City on the Muddy Missouri. –[From a Special Contributor to The Times.] Last May, upon the recommendation of Gen. Nelson A. Miles, the Secretary of War gave the Twenty-fifth United States Infantry Bicycle Corps authority to make a trip from Fort Missoula, Mont., to St. Louis, Mo., the object of the experiment being to test the practicability and the durability of the bicycle as a means of transportation for troops. The corps consisted of Assistant Surgeon J.M. Kennedy, one sergeant, two corporals and seventeen privates, commanded by myself. As thoroughness was to be a leading feature, the experiment was made under all possible conditions, except that of being under actual fire—the command made and broke camp in the rain, traveled through mud, water, sand, snow, over rocks and ruts; forded streams and crossed mountain ranges; suffered from heat, cold, hunger, the loss of sleep, the ill-effects of alkali water. Indeed the corps underwent all sorts of experiences; and as the journey progressed the climate, the scenery and the people were ever changing. Verily, the trip may be likened unto a grand panorama, consisting of four views, (1) The beautiful rivers, colossal mountains and fertile valleys of picturesque Montana. (2) the dreary, yet fascinating lands of Northwestern Wyoming and South Dakota. (3) The barren, God-forsaken sand-hills of Nebraska, and later on, her rolling hills and immense wheat fields. (4) The waving corn-fields of historic Missouri. On June 17, 1897, as the report of the reveille gun was reverberating through the mountains surrounding Fort Missoula, the Twenty-fifth United States Infantry Bicycle Corps was bounding along in front of “The Officers’ Line” en route to St. Louis. Old Sol had just shown his beaming countenance above the peaks of the Bitter Root range, and casting his radiant smiles upon the cyclist boys in blue, seemed to promise them that this, their first day should indeed be one of sunshine. Thirty minutes later, as we glided through the streets of Missoula, a crowd that had risen earlier than usual in order to bid the corps godspeed gave us a hearty cheer. Taking a northeasterly course, we followed the Hell Gate Canon as far as Bonner, a small town seven miles from Missoula, and then for twelve miles wended our way along the Big Blackfoot River. The bridge across the river at this point having washed away a few days previous, the command was ferried across, seven at a time, in a small boat, manned by two logmen. At 11:35 o’clock we stopped for lunch, at a ranch twenty-five miles from the fort, intending to resume our ride about 4 o’clock. About 12:30 o’clock, dark, threatening clouds began to gather in the west, and in a short time a heavy rain, accompanied with thunder, lightning and wind , was upon us. It was, however, of but short duration, and when it ceased we immediately packed our bicycles and started off as if pursued by an enemy many times our strength. The year before, myself and the eight soldiers who constituted the bicycle corps had been caught in a rainstorm in this same section of gumbo earth, and the way we had paper was still “verdant green” in our memories. For a while we fairly flew through the woods, but the rain was soon upon us again, and once more did we plod along in vicious gumbo mud, with water gently trickling down our backs—all wet, muddy and slushy, now rolling our wheels through weeds and underbrush on the roadside in order to avoid the mud, and then carrying them a few paces. Occasionally we would stop to scrape the mud off the tires with our meat knives or flat pieces of wood. No one but a person who has had the actual experience can appreciate the sensation of being caught with a bicycle in a rain in gumbo mud—words are inadequate to express it. All those indefinable feelings of “let-me-alone-and-I’ll-let-you-alone,” “I-was-born-unlucky-anyway,” and so on—all these undefinable feelings manifest themselves in all their glory. Indeed, should the recording angel even wink at anything mortal man does, says, feels or thinks, this is the time he should be magnanimous. A little after 3 o’clock the weather began to clear away, and we took an hour’s rest. Resuming our ride, or rather our march, over muddy, hilly roads, we passed Clearwater postoffice about dusk, and an hour later pitched camp at Cottonwood 54 1/2 miles from Fort Missoula. “OFF FOR ST. LOUIS--Twenty-Fifth Infantry Bicycle Corps Takes Up Its Long March--Lieutenant Moss and Men Leave Missoula This Morning on a Long Wheeling Trip-- One of the most important journeys even taken out of Missoula was begun this morning when the Twenty-fifth Infantry, U.S.A. Bicycle Corps under the command of Lt. J.A. Moss left for St. Louis, Missouri. All of the men, twenty-three in number, will make the trip on bicycles. The corps is composed of Lt. Moss, Surgeon J.T. Kennedy and twenty colored privates, four from each company stationed at Fort Missoula, who will ride the Spaulding Army bicycle, especially manufactured for this trip, which will be made a test for the use of the bicycle in the United States army. Edward H. Boos of Missoula accompanied them as official reporter. He rides a twenty-five pound Sterling bicycle and will carry a thirty-one pound pace of blankets, tent, clothing, camera, notebooks, etc. He will send reports to some of the leading papers in the United States as well as to the Daily Missoulian. Missoula is his home address. The route to St. Louis will be east along the Northern Pacific to Billings and thence along the Burlington to their destination. They will make about forty miles per day, weather permitting. Fourteen places along the route have been designated as supply stations as follows: Avon, Helena, Livingston, Billings, Ft. Custer, Montana; Lariat and Newcastle, Wyoming; Marshland, Mullan, Litchfield, Seward, Nebraska; Napier, Laclede, and Louisiana, Missouri. Helena, Mont., July 1, 1897 -- As the sunrise gun was booming the break of day, 23 bicyclers glided out of Fort Missoula, with St. Louis, Mo. as their objective point. The party consisted of Lieut. Jas. A. Moss, commander; Dr. Jas. M. Kennedy, surgeon; one sergeant and 19 privates; and Edward H. Boos, official reporter, all mounted, with the exception of the latter, on Spaulding military bicycles, which are the regular 1897 road machines, with a few alterations. The average weight of the machine packed is 55 pounds, including rations. Each man carries a half tent, blanket and changes of clothing and his share of the rations, while extra parts and repairs are apportioned among the men. The run from the fort to Missoula, a distance of four miles, was made in 20 minutes, the troop, as it approached the city on the bridge in double file, with its white packs and glistening wheels, making a beautiful showing. The run from Missoula to Bonner, seven miles, was made in good time. Here [Bonner] the corps left the line of the Northern Pacific and headed up the Big Blackfoot river, expecting to meet good roads and avoid some very bad ones and steep grades, which would have been encountered if the railroad had been followed. We ran up this beautiful mountain river for several hours on excellent roads and easy grades until interrupted in our progress at McNamara’s crossing, the county bridge being washed out, but where we found a boat to ferry us across the water. At this point the river is very swift and careful navigation was necessary. The boat carried eight of us at a time, with our wheels, the portage occupying about 45 minutes. All being safely landed we again started our way, leaving the Blackfoot behind and crossing the low range between this river and Camas prairie. As we reached the summit and saw the beautiful valley laying below us we were charmed, the meadows and low lands being covered with a sea of blue flowers, from which the valley takes its name. We reached Potomac shortly after 11 o’clock and had a few minutes breathing spell. Pushing on we made a few miles more and stopped for lunch, our first meal out of the post. Now came the time for taking the rations from the cases on the wheels and preparing lunch. The boys were not acquainted with the distribution of the rations among the men and several laughable incidents occurred. While lunch was in progress clouds came up and a few drops of rain fell, giving us warning of an approaching storm. Profiting by last year’s experience in this district, camp was broken immediately and a forced march started. While in the timber and only a few miles ahead of our lunching place the storm broke with all its fury, giving us our first bad weather, which stayed with us for several days. The soil in these woods is a black, clayey composition called “gumbo” and is the terror of any wheeled vehicle which may be unlucky enough to be forced to travel through it. In a short time our wheels were clogged with this mud and presented a sorry sight. To add to this the rain continued to pour down in sheets, drenching us completely and causing us much discomfort. At this time the gear cases covering the chain on the wheels were given a practical test and proved a great success, keeping the chains perfectly dry and free from mud. The weather continued bad and as we climbed a long hill, the hard work was telling on some. We progressed, however – “it is a long hill that has no end,” and we reached the top, after more plodding and slipping and pushing our wheels. The descent was fully as bad as the climb, we being compelled to walk in the mud, holding our machines back, often scraping the “gumbo” off our wheels. After a series of steep descents we reached the valley below and rested a half-hour; in the meantime old Sol sending his shining rays through the clouds and rejoicing on the prospect of clear weather again started on our journey, riding about a mile on a poor road and slippery mud. Here we came to a large irrigating ditch and had our first experience in carrying our wheels across a stream, with bad sand below our feet. “The first day of the trip was a hard one. At 11.35 A.M we stopped for lunch at a ranch 28 miles from the Fort, intending to resume our ride about 5 o’clock. About 2.30 dark, threatening clouds began to gather I the west, and in a short time a heavy rain accompanied with thunder, lightening and wind was upon us. It was, however, of but short duration and when it ceased, we immediately packed our bicycles and rode off as rapidly as possible. The year before, myself and the eight soldiers who constituted the Bicycle Corps, had been caught in a similar ranstorm in this same section of gumbo earth, and the rememberance of it was still fresh in our minds. For a while we fairly flew through the woods, but the rain was soon upon us again; and for several miles we plodded along in this viscous, gumbo mud. George Niels Sorenson's book Iron Riders is the most thorough account of the bicycle corps. It can usually be found on Amazon for $11 or $12 dollars. Moss describing the second day's trip after camping at Cottonwood for the night.....“Early the next morning the corps was on the road again. The atmosphere was damp, raw and penetrating, the fog being so heavy that we could not see 100 yards ahead. Ovando, eleven miles away [from COTTONWOOD], was reached at 7:30"
“Our first night in camp [Cottonwood, MT] was a very cool one. At 4 o’clock in the morning reveille was sounded and all was activity in the camp. Roll call was disposed of and breakfast was served at 5 o’clock. Our wheels were packed and our second day’s start began. A heavy fog had settled down and the machines were wet from condensation. We had fair time and were soon in another mountain valley dotted with numerous lakes on which many ducks were resting. The corps moved along in good form, and good roads were before us. We were soon at Ovando and had a few minutes rest. ".....The Potomac camp operated until 1916. From May to October of that year, the operation moved west to the Nine Mile Valley with headquarters at Stark, Montana. 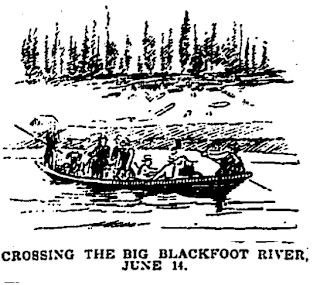 The Blackfoot valley was not logged extensively from 1916 to 1926. Operations resumed in that valley in 1926, when the mill's logging operations were moved to Greenough, Montana. The railway was extended the mail line fourteen miles to Sunset, then added branch lines up Belmont Creek, Blanchard Creek, and Elk Creek. That camp lasted until 1934, when operations moved to Woodworth, just south of Seely Lake, Montana, in the Swan Valley. It had both permanent and portable buildings, including bunk houses, a mess hall and kitchen, office and community building, school, library car, repair and machine shop, and family housing. The rail line extended another fourteen miles to Cottonwood, Montana. The ACM ran another line from Cottonwood to Woodworth and branch lines from Blanchard Flats to the Cottonwood Lakes to Monture Creek." I'm a senior at UNCA and am thinking of doing my senior research project on the twenty-fifth, and had a few questions for you. I picked up a copy of "Iron Riders," but noticed that Sorensen doesn't list where he got the diary entries of Moss from. I'm in the process of compiling a list of primary sources, and was wondering if you know where these diary entries can be found? I've also been in contact with the Fort Missoula museum and am wondering if they have the actually copies of his diaries? Thanks for any information! The source isn't a diary, it's a report that Moss wrote to the Army. It can be found at the National Archives. Moss also wrote a fairly extensive article for the L.A. Times. If you'll send me an e-mail address I'll send you more. Thanks for the response! I just happened to be on your site and saw your reply, sorry for the delay. I went to the archives back in April and found a number of useful documents, it was interesting to hold the documents in person and try to figure what Moss was had written! If you could send me the email that you had mentioned in your previous response it would be much appreciated. My email address is atduchac@unca.edu. Thanks and have a good weekend!